Online retailers are gearing up for another holiday season—and another Black Friday. But is Black Friday still one of the biggest shopping days of the year? We think so. After crunching the numbers—and combing through last year’s statistics—we’re predicting a record-breaking Black Friday 2017. Our estimations include several million more online shoppers and millions of dollars in additional revenue to match. These predictions will help you prepare for the big day ahead. Amazon with 7.95 million unique visitors. Walmart with 4.15 million unique visitors. Best Buy with 3.75 million unique visitors. Target with 2.85 million unique visitors. Apple with 2.58 million unique visitors. We think it’s safe to say these websites will fall in the top five again this year. After crunching numbers from the National Retail Federation’s 2016 Holiday Shopping Forecast, we determined that 80.29 million people shopped or planned to shop on Black Friday 2016. NRF also predicts general holiday 2017 holiday sales will increase between 3.6 and 4 percent. Using these statistics, our forecast for 2017 is a conservative 83.18 million online shoppers. Amazon at an estimated 8.23 million unique visitors. Walmart at an estimated 4.29 million unique visitors. Best Buy at an estimated 3.88 million unique visitors. Target at an estimated 2.95 million unique visitors. Apple at an estimated 2.66 million unique visitors. According to Adobe, Black Friday 2016 set a new record by achieving three billion in online sales. Sales were reported at $3.34 billion—a 21.6 percent growth from 2015. Black Friday 2014 and Black Friday 2015 had a 24 percent and 14 percent year-over-year increase respectively. If retailers see the average 19 percent growth this year, they can expect sales to nearly hit the 4-billion-dollar mark at $3.97 billion. 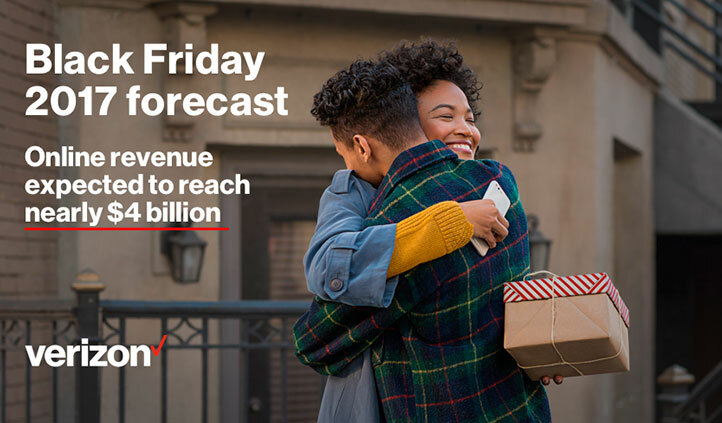 Spreading out the $3.97 billion in revenue over a 24-hour day—we predict the 83.18 million online Black Friday shoppers will spend an average of $165.41 million an hour. We expect to see a similar spike in growth again this year—meaning Black Friday 2017 could bring in nearly $1.6 billion in mobile revenue. Adobe stated that mobile traffic accounted for over half of online traffic and nearly one third of online sales on Black Friday 2016. If this doesn’t convince brands that mobile strategy and optimization are more important than ever, we don’t know what will. Some large retailers—like Macy’s—experienced tech challenges during Black Friday 2016. We hope 2017 will be the year where everyone is prepared for high traffic volume. Retailers could be missing out on their share of the $2.5 million being spent every minute of Black Friday 2017 if they experience site issues. This estimate is based on our prediction of $165.41 million dollars an hour by spreading out the total spend over a 24-hour day. Is your business prepared for Black Friday 2017? Hopefully, retailers work with IT experts to prepare for the upcoming holiday season and busy shopping days that accompany it. Load tests determine how many visitors a site can handle at a given time and help businesses plan for the influx of traffic during Black Friday. We hope these predictions have provided insight to help you prepare for Black Friday 2017. Simply put, plan for more traffic—and more revenue—than last year. 2018 small business growth spurt: Are you ready for it?